Red Bud Catholic Cemetery | A tribute to a small corner of Maple Township, Cowley County, Kansas. Not an official site of Red Bud Catholic Cemetery or any agency or organization associated with it. Joseph Otto Kuntz, known through much of his adult life as “J.O.,” was born on January 12, 1850 in Duchouquet Township, Auglaize County, Ohio, near Wapakoneta. He is the seventh known child of Anton (Anthony) Otto and Rosina Baudendistel Kuntz, and their third son. (Anthony Otto was an immigrant from Germany; Rosina was the daughter of German immigrants.) He was born in just about the middle of the birth order of the family. He grew up on the family farm in Ohio and it seems he stayed there until his marriage to Anna Maria Craft in 1872. Anna Maria Craft was the daughter of Edward Craft and Susanna Busch Craft, who donated the land for the cemetery to the church. She was born on January 25, 1853 in Auglaize County, Ohio, the fourth child and first daughter in the family. By the time she was seven, the family had moved to Boulder, Linn County, Iowa, but returned at some point before 1867. J.O. Kuntz was a successful farmer. Eventually the couple purchased other land near their original farm, including the land surrounding the cemetery. Only four of their children survived to adulthood. Only two children lived longer than Joseph, and only Charles lived longer than Anna. All six children are buried in the Red Bud Catholic Cemetery. will take you to the Kansas Historical Society’s Kansas Memory site, and to a page showing a map of Maple Township in 1905. If you look in Section 14, you’ll see some of J.O. Kuntz’s land, and the cemetery and church marked out as well. At some point between 1905 and 1910, J.O. and Anna moved from their farm (without selling their land) to Winfield. In later years, they moved between Udall, Wichita, Winfield, and Peck. Since posting this story, I was able to get copies of Joseph’s and Anna’s death certificates, which has allowed me to add a little more information about them. Death certificates are notoriously error-prone — obviously, the person named did not fill them out; sometimes the person who supplied the information was misinformed, had reached a stage of forgetfulness, hid facts, or may have been so upset by the death that they answered incorrectly; sometimes the person supplying the information did not know the deceased individual at all. The death certificates of Anna and Joseph suffer some of these problems. From Joseph’s death certificate, we learn that he died “3 [miles] E[ast] and 3 1/2 Miles N[orth] of Udall, Kansas,” in Maple Township. He had last worked as a farmer in 1925. The doctor filling out the medical side of the certificate indicated that he had been treated for a “Blood Clot on Brain” as of December 1936 , which probably indicates that he had a stroke. The doctor said he attended him as of December 1, 1935 until February 21, 1936, so it is likely that the stroke occurred on December 1, 1935. His son Charles was the informant for the ‘personal and statistical particulars,” much of which is in error. Apparently he was also confused as to whether he was being asked about his parents or grandparents, or the clerk misunderstood his answers. Joseph was buried in Bed Bud Catholic Cemetery on February 25, 1936. Anna, who was by that time blind, lived with her son W. A. (Bert) Kuntz and his wife, Dolly. In 1941, Bert died. Anna continued to live with Dolly until her death on November 29, 1942. She died at 8:30 that morning. Her cause of death is listed by the doctor who signed the certificate as “chronic myocardial degeneration” and “senility.” Charles was again the informant on the other side of the certificate, and although more of the answers are correct, there is missing and incorrect information here as well. Anna was buried in Red Bud Catholic Cemetery on December 2, 1942. Jan, as I told you my parents were from Mulvane and some of their relatives lived in Winfield and Udall. Daddy went to a one room school in Cowley County, Kansas. I am 70 years old and a retired school teacher. When I was young (before TV) we always went for Sunday drives with the grandparents (I was an only child) and one of the places we visited a lot was cemeteries. I knew the cemeteries so well I could give tours as knew where most of graves were and stories of the people buried there. This was way before perpetual care at cemeteries and folks had to come out and clean the graves, weed, plant flowers, etc. While Daddy and Grandpa did that my Mother and I would walk around searching for pieces of history. I made collections of it. We took a little pail and walked around until we discovered something we liked as a remembrance. I have kept all of these over 65 years. The wood is from a tree branch that fell to the ground at Redbud in the 1950’s. We took it home and Daddy cut a cross section, sanded it and on one side made decorative grooves around it. The acorns are from the trees at Redbud that Mother and I collected off the ground. Around the foundation of where the church was…church was gone in the 1950’s as I don’t remember it Mother and I collected pieces of glass, some of it is colored glass maybe from stained glass window, pieces of pottery and nails that look handmade. I have done genealogy for over 40 years especially my Great Grandparents…Christian and Mary Cecilia Harty Beiswanger are buried at Redbud Cemetery. It is spelled with two “S” on their tombstones (German spelling) but most of the family later used one “S” in Beiswanger. My Dad told me lots of stories about them as he spent a lot of time at their house when he was young. I am glad Redbud Cemetery is getting some thought. Let me know if you need anything…maybe other folks will share their Redbud photos on your website. I would love to see a photo of the church. One of my cousins said she thought it was moved to Winfield in the 1940’s. 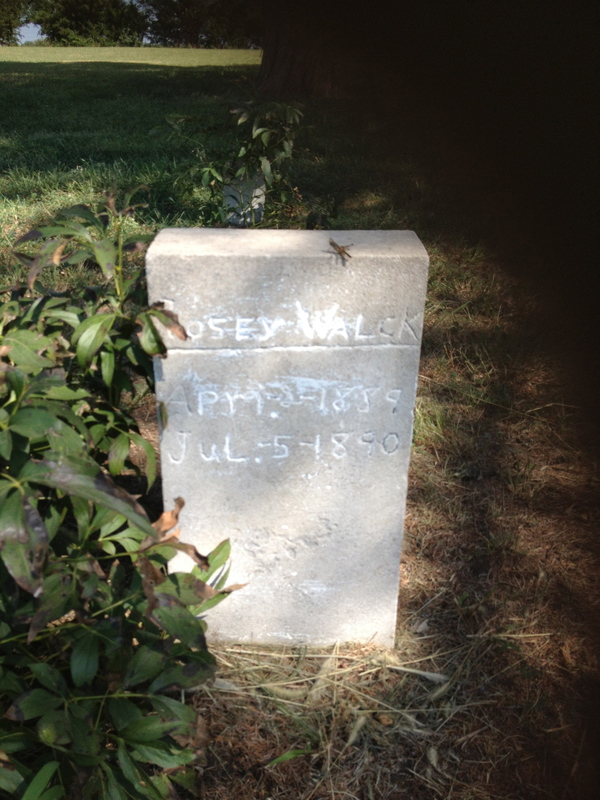 Another addition…I attached my Great-Uncle Lee’s tombstone in Redbud Cemetery. My Great-Grandparents Christian and Mary Beisswanger had five children. One of the five children, my Great-Uncle, Leo James “Lee” Beiswanger and his wife, Margaret E. Preston Beiswanger are buried in Redbud Cemetery. When I was young we would go to the Beiswanger Reunions in Udall where I would see Great-Uncle Lee and his brothers/sister. The [photo above] is all the Beiswanger siblings, Leo James “Lee”, Raymond Earl, Henry Christian Beiswanger, Mae Ethel Beiswanger Parkins and my Grandmother, Grace Violet Beiswanger Howard. Grace is wearing the hat. This photo of Edward Craft and Susannah Busch Craft and their adult children was probably taken near their home in Auglaize County, Ohio. Edward and Susannah are seated. It was their gift of land to the church that established Red Bud Catholic Cemetery. Part of the Edward and Susannah Craft lands are shown below on a section of an 1882 land map, a detail from a map of Maple Township (Township 30). You can see the three acres of the cemetery in the southwest corner of Section 14. In the northeast corner of section 23, the road from these lands, you can see the name J.O. Kuntz. One of Edward and Susannah’s daughters, Anna Maria, and her husband, Joseph Otto (J.O.) Kuntz, purchased land on May 1, 1874. Later, they owned the land surrounding the cemetery. I’ll have much more information about this couple and others mentioned here in future posts. As you’ll see in those posts, at least four of these families were from Auglaize County, Ohio: the Busch, Craft, Kuntz, and Walck families. Lands owned by Susannah’s brother, Michael Andrew Busch, and his wife, Anna Maria Walck Busch, can be seen in section 22. Anthony Joseph (A.J.) Walck is Anna Maria Walck Busch’s brother. Edward Andrew (E.A.) Busch (sections 14 and 23) is the son of Michael and Anna Maria Busch. Their daughter Susannah married F.X. Wegerer (section 23). Although not everyone named on the map is a family connection, Busch, Craft, Kuntz, Rader, Walck, and Wegerer are among those who are. On November 18, 1878, Edward and Susannah Craft quit claimed the three acres that now contain the cemetery to Louis M Fink of Leavenworth County, Kansas. Who was Louis M Fink? He was the Bishop of Leavenworth Diocese, part of the Archdiocese of St Louis of the Roman Catholic Church. This donation established one of the only two Catholic cemeteries in Cowley County. Bishop Fink had been consecrated to that office in 1871. The 1896 newspaper article which featured the image above mentions that at the time he became the bishop, there were only thirty-three Catholic churches in the state. Catholics were not always accepted — there is a long tradition of anti-Catholicism in the U.S.. Priests had to ride circuits to serve their mission congregations, and were harassed and assaulted. When Catholic immigration from Italy, Ireland, Germany, and other countries increased, the “Know-Nothings” and other hate groups raised fears of a “Romish” takeover of the country, especially its schools. This anti-Catholicism was as alive in Kansas as anywhere in the U.S.. Two years after the bishop’s silver jubilee, at a time when the number of Catholics in the state had increased nearly tenfold, the Arkansas City [Kansas] Traveler published an anti-Catholic article on its front page, its first point including a declaration that “the principles of the Romish church are opposed to our free institutions.” Catholics were also the object of attacks by the Ku Klux Klan. HOLY NAME CHURCH The first missionaries who ministered to the Indians and afterwards to the few Catholic first settlers here, were Reverends Schumaker and Boncilione, Jesuit Fathers from the Osage Mission, now St. Paul’s Mission in Neosho county. Later the Catholics were attended by priests from Independence and Wichita. The Catholics first built a small frame church on the site of the present one. Under Rev McKernan, the present massive stone structure was erected at a cost of about $115,009 and the old frame building was sold to the Catholics of Red Bud, who moved it to that place and are still using it as a house of worship. I have not yet discovered exactly when the gifted land began to be used for a cemetery, but it all likelihood it was put to use soon after it was given. Catholics would have felt an urgent need for consecrated ground for the burial of their dead in a time when high rates of childhood mortality, deaths in childbirth, and the ever-present dangers of accidents and illnesses were never far from the thoughts of these settlers. The land is marked as a Catholic Cemetery in an 1882 Township Map. I hope to find a registry of burials through the church or other records, but for now these early burials are unknown. Of the markers that can be seen there today, the earliest burial seems to be Rosey Walck’s, in 1890. The U.S. government made the lands of Cowley County, Kansas available for purchase through the Osage Lands Act of 1870 and 1872. The population of the county boomed. In Cowley’s Maple Township, a community named Red Bud was established northeast of Udall. In March, 1873, the Red Bud post office was opened. About a year later, on March 14, 1874, Michael Craft and his wife Sarah Eckenweiler Craft took advantage of the government’s offer and bought 160 acres of land in the southwest corner of Section 14 of Maple Township for $200. This acreage included the land that would later become Red Bud Catholic Cemetery. Michael and Sarah Craft were from Auglaize County, Ohio. Several owners of neighboring lands in Maple Township were also Catholics of German descent who came from Auglaize County, and we will explore those connections in future posts. The graves of Red Bud Catholic Cemetery include many family names that can also be found on the gravestones of Catholic cemeteries near Wapakoneta and other communities in Auglaize County, as well as in nearby Dayton, Ohio. Michael Craft’s family was prominent among the early settlers of Auglaize County. He was the eldest son of Edward Craft and Susannah Busch Craft. Edward’s father, William Craft, was born in Pennsylvania. He fought in the War of 1812, then moved west across Pennsylvania to Ohio, settling in the Auglaize County (then Allen County) area by the mid-1830s. Susannah Busch Craft’s parents immigrated from Wyhl, Baden in 1817 to Pennsylvania, gradually moved west, traveled down the Ohio River on a log raft, and settled in Auglaize County by 1834. Auglaize County was home to many immigrants from the principalities and duchies that eventually became Germany. By 1874, many of the children and grandchildren of these immigrants were looking for their own lands to settle. Michael and Sarah Craft did not keep the Kansas land they purchased for long. On July 17, 1874, they sold the land to his parents, Edward and Susannah Craft, for $425. The oldest grave I know of in the cemetery is that of Rosey Walck, who died when she was fifteen months old.